The shy Scoat Tarn sits in a valley between Scoat Fell and Wasdale Red Pike, at the upper reaches of the valley of Nether Beck. Its position means that it can only be seen from a few locations. The tarn takes the form of an irregular oval, with all of its streams entering and leaving on the north-western side of the tarn. Most of the surrounding slopes are relatively gentle, but the eastern slopes, heading towards Red Pike, are steeper and lined with crags. The shores of the tarn are largely grassy, with some scattered boulders. Scoat Tarn is thus largely hidden from Red Pike itself, but does form part of the view from the pass leading to Scoat Fell. The tarn is also glimpsed from the summit of Seatallon, although that fell is only slightly higher than the tarn, so it only appears as a narrow band of water. It's location can also been seen from nearby Middle Fell, although the tarn is actually higher than the summit of the fell, so the water is hidden. Although Scoat Tarn doesn't sit on a right of way, it can be reached along a reasonable footpath. This runs from the valley of Nether Beck up to the col between Wasdale Red Pike and Scoat Fell. If coming up from Nether Beck this path is actually much clearer on the ground than the official route of the right of way past Little lad Crag - at the head of the valley our path crosses two becks and climbs up to the north-east to reach the tarn from below. From above the route is very clear - just follow the best route down the slopes with the tarn clearly in sight almost all the way. Two nameless becks flow into Scoat Tarn, one rising on the slopes below the col between Red Pike and Scoat Fell and the other in the are between Great Scoat Fell and Little Scoat Fell. 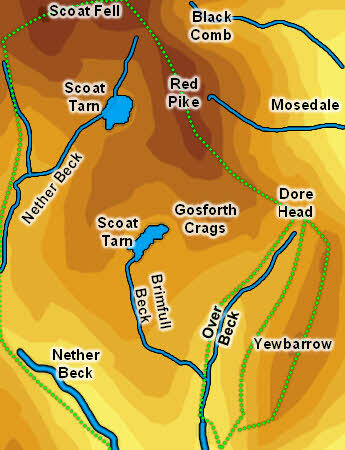 Scoat Tarn drains along a beck that flows south-west, and that is one of the sources of Nether Beck, which flows south into Wast Water.